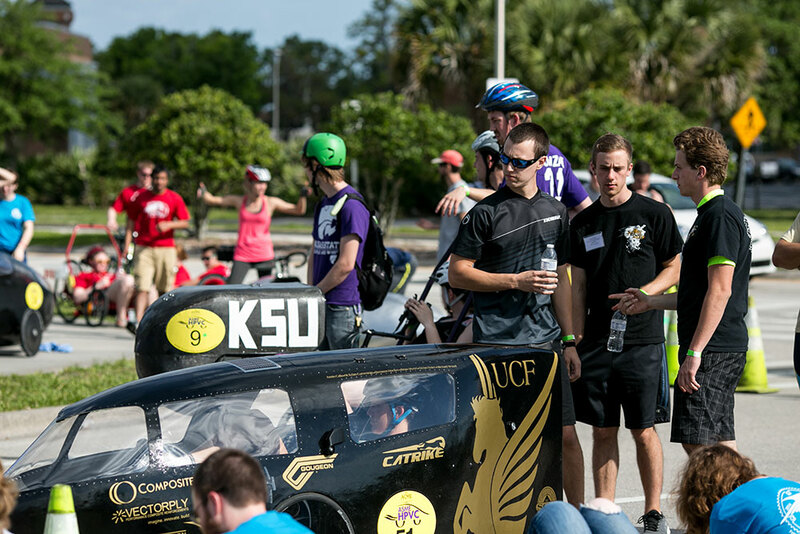 "We built the entire vehicle from scratch," mechanical engineering student Brennon Hocker says of the Knightrike. "The [body] is multilayered carbon fiber and designed to be lightweight and aerodynamic." “We had been looking at the other teams for a year-and-a-half, studying who was going to be our biggest competition,” says Hocker. 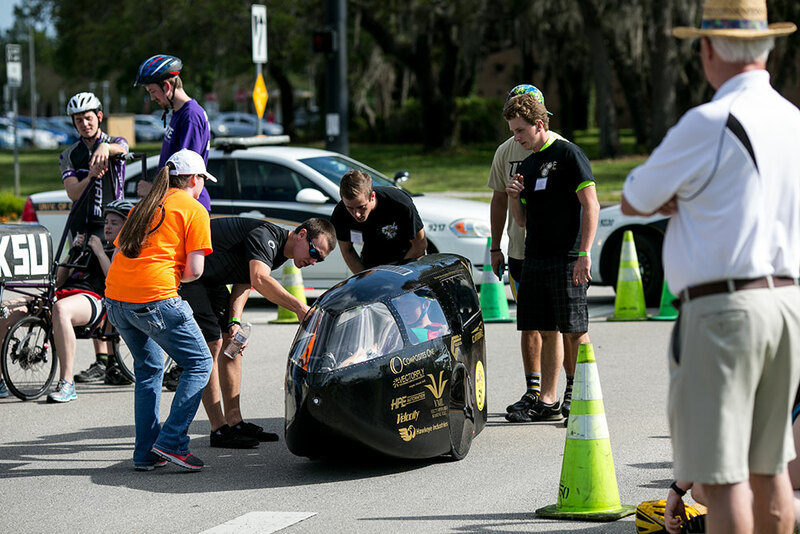 The Knightrike, which cost $12,000 for parts and materials, was built in a team member's garage as a senior project. "[The Knightrike is] a very planted bike with a low center of gravity that’s hard to flip and accelerates very quickly to a high top-end speed," Hocker says. "It handles awesome and is extremely nimble, but it gets a little hot in there, as this model is not designed for comfort." 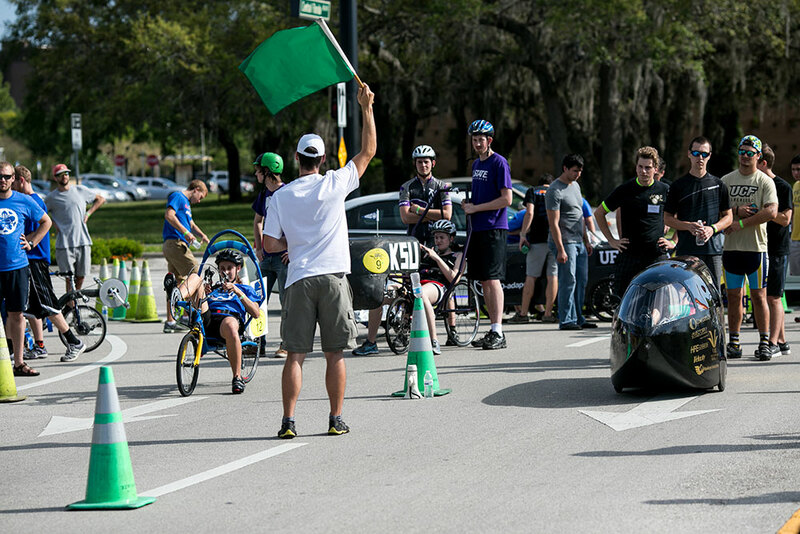 "I’ve never raced anything like it," says Rebecca Whitsitt, a UCF mechanical engineering student and bike racing enthusiast who was recruited by the Knightrike team to help pilot the vehicle. "It was fun to be aggressive through the tight corners. I wish I could race it every weekend." "It was a lot of fun getting into head-to-head [sprints] with the other teams on the circuit," says Hocker. "We had some drag races with Rose-Hulman Institute of Technology and the University of Toronto to show off for the crowd."